This map was made according to the wishes of one of my long time patrons as an on-going $5 reward. I was asked to do a detention block with some interrogation rooms and to me this sounded like a very useful idea. 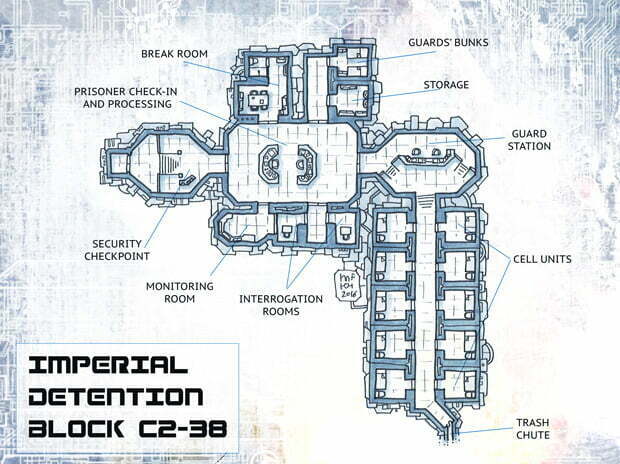 I decided to design this cell block as a modular unit that could be easily slapped together with some other map or used in many different settings (regardless of its starwarsy name). Also included: the mandatory trash compactor chute. This map was originally published on Patreon with the support of my awesome patrons in October 2016.